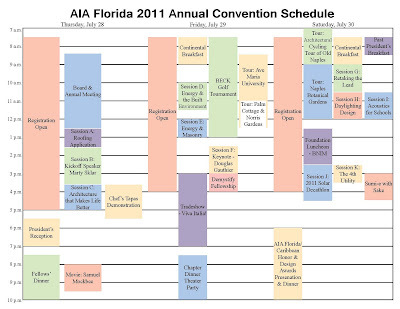 perFORM[D]ance at AIA Florida Caribbean Annual Meeting! 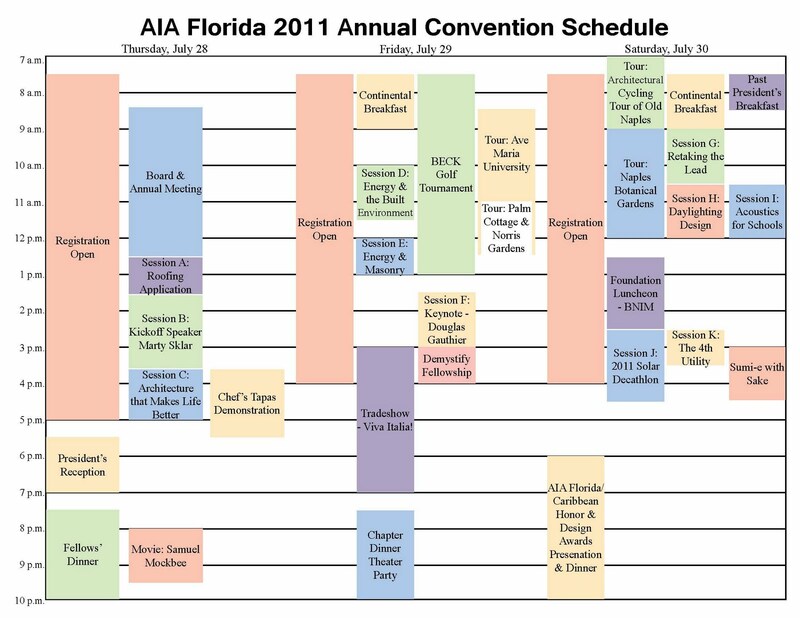 On Saturday afternoon, we were invited to speak at the Annual Meeting of the AIA Florida Caribbean Region in Naples, Florida [Session J]. It was a great honor ! Drove straight from the construction site across the Everglades to speak. LOTS of people were there! Carl Abbott, FAIA, renowned Sarasota architect and former student of Paul Rudolph, admired the house and was especially interested in the louver panel system. The communications and media team for the perFORM[D]ance House continues to work very hard on getting the exhibit materials done for the August 11th deliverable. We are working on the Tour signage, the brochure and the uniforms. Anibette and Gaby as they discuss exhibit materials at construction site. The website is also under continuous development as we work on presenting our House the best way possible to educate the public on the global importance of this amazing project. 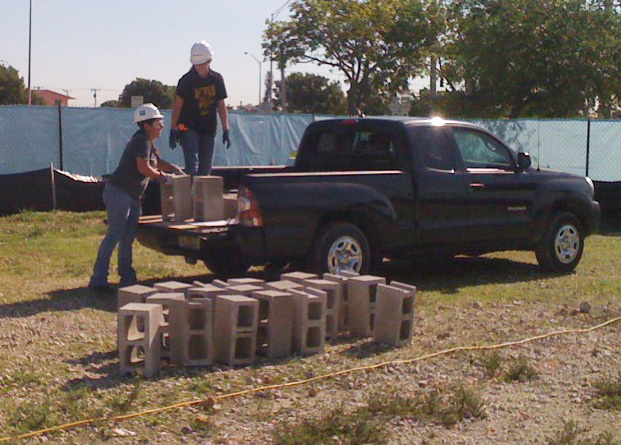 Check out the Department of Energy website to learn more about the Solar Decathlon Competition. Deana, Joseph, Prof. Marilys and Anibette as they discuss website design. Also, the communications team is working on four different videos, which will be presented to the judges prior to the competition, these videos will be our first impression, so we are working diligently to make these videos rock! These videos will be about the Architecture, Engineering, Market Appeal and the Walkthrough of the perform[D]ance house. Take a look at our team in action! 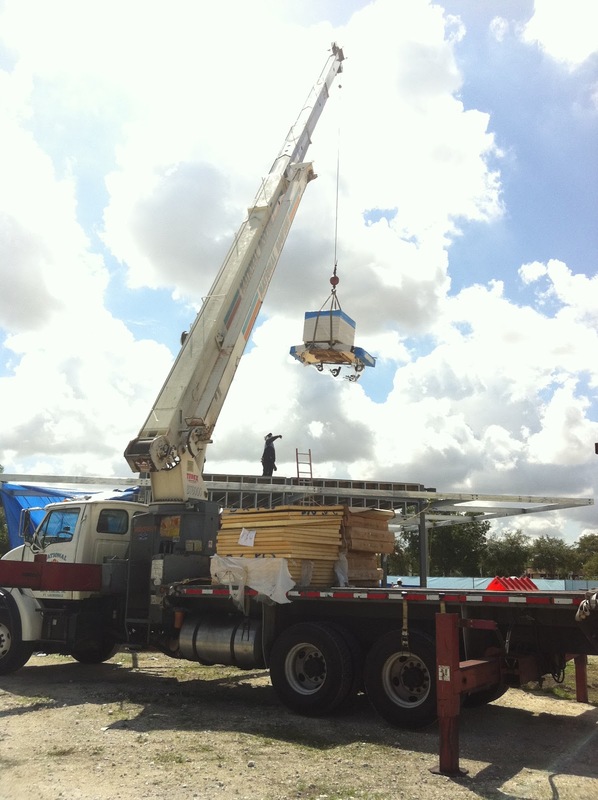 As they work in the Studios of the FIU School of Architecture and on the construction site as well. Insulation was finished on the floor and the sub-floor was installed and completed with plywood. 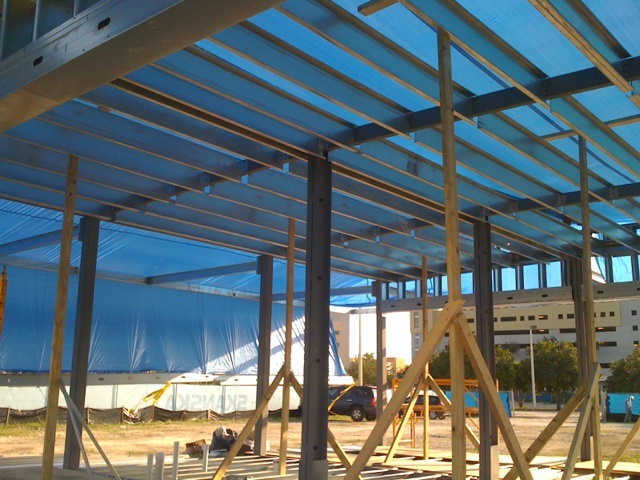 The framing for the South wall and the interior framing for the core were completed as well. 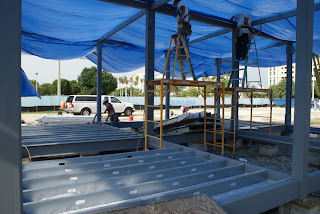 The team continues to work very hard on building the deck modules. 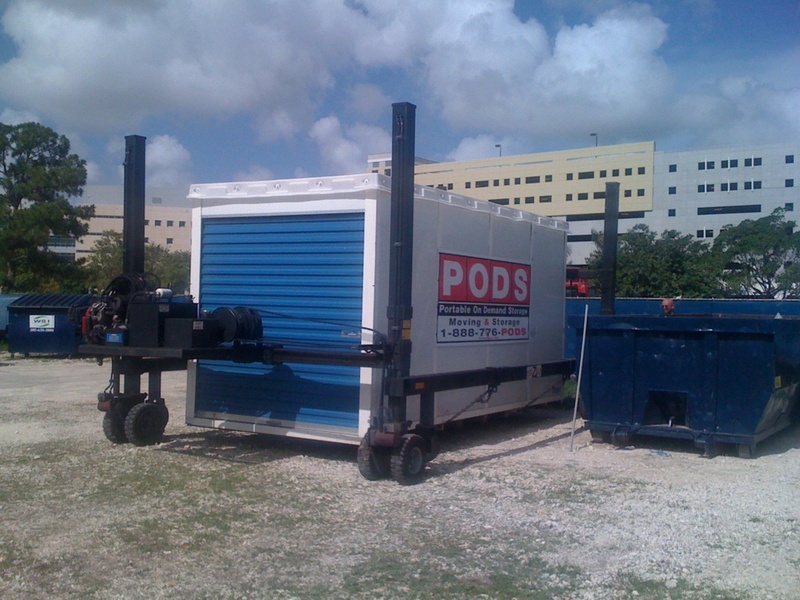 Also, the storage POD arrived today. Now we are going to be able to safely leave all the materials secured from rain during non-working hours. 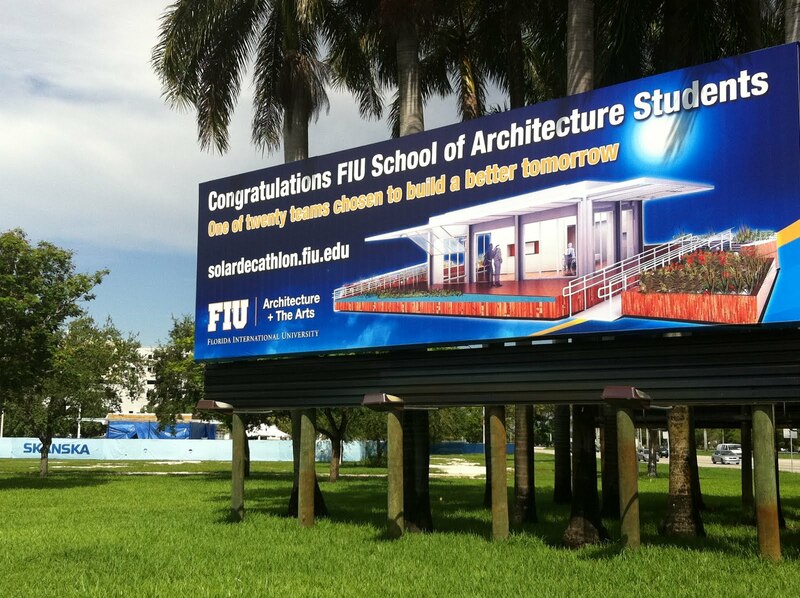 The university gave us an awesome surprise of putting up a BILLBOARD congratulating the students for this amazing project! 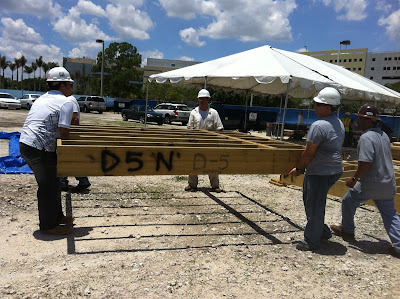 Today, the team began laying out the temporary foundations for the deck of the perform[D]ance House. 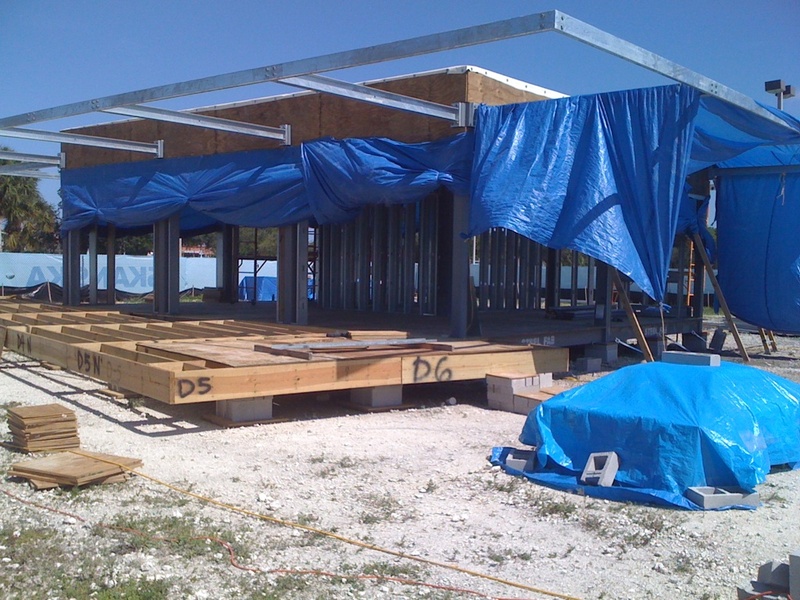 The foundations consist on two sheets of plywood, concrete block and then more plywood to level each one of them. After laying out the foundations, the deck pieces belonging to the north side of the house were laid out to make sure the built modules fit right in place. Insulation began yesterday but rain interrupted the process, so the team helped taking the water out of the floor and drying it so that they can continue insulating the floor.The team continues to make excellent progress, keep up the good work! The students have been working diligently at the construction site as they build the deck for the perform[D]ance house. Take a look at the progress that has been made so far, the modules are half way done in the assembly process. A lot has been done but there is still a lot to get done! 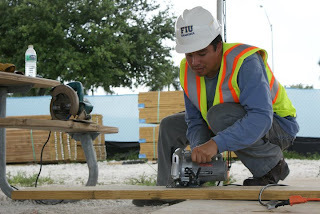 Keep up the good work FIU TEAM! 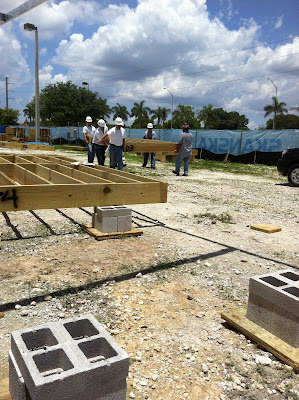 Team re-locating the deck modules as they continue to build them! Piles of wood for the deck! Team members helping carry these heavy deck modules!! As we continue with the construction, over the past two days, our Architect of Record and Structural Engineer of Record passed by the site for inspections and observations! Alfonso, our General Contractor with Chrissy our project construction manager! 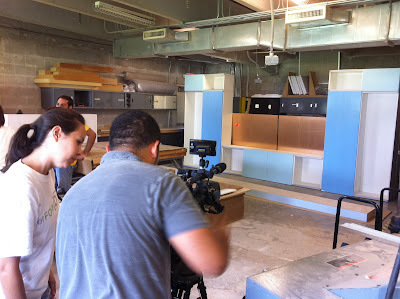 We are in good shape and continue to work hard towards our final goal: Washington DC and winning the Solar Decathlon 2011 competition! 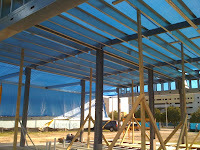 The FIU perform[D]ance house is making a lot of progress as we build in the hot and rainy summer weather. Our sponsors/contractors are doing a great job as well as all the students taking part of this exciting journey. Roof Plywood arriving on site! Take a look at the construction site as floor joists are being installed, roof joists, and roof plywood arriving on site. House Frame almost ready with Floor + Roof joists in place! 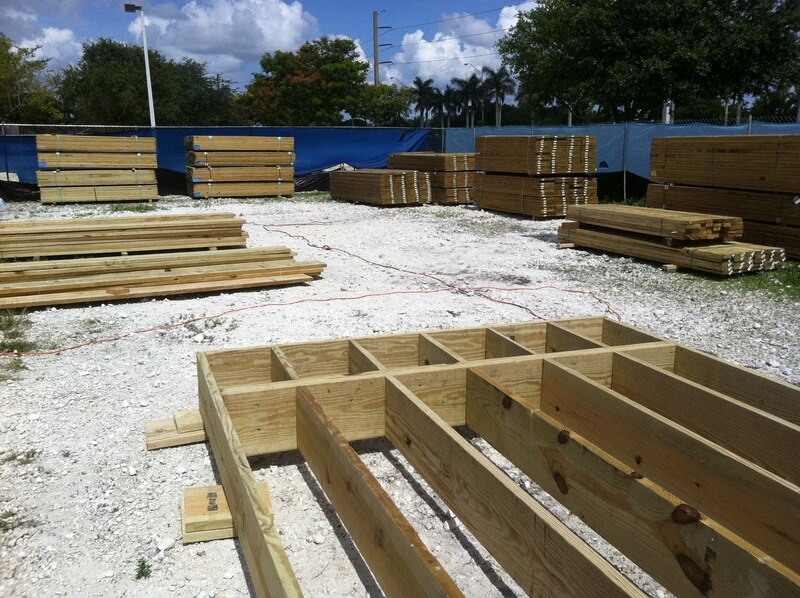 Wednesday July 13th the Wood for the construction of the Deck arrived on site!... The deck area is 1,500sqft, which is double the area of the interior of the house, which is aprox 800sqft. 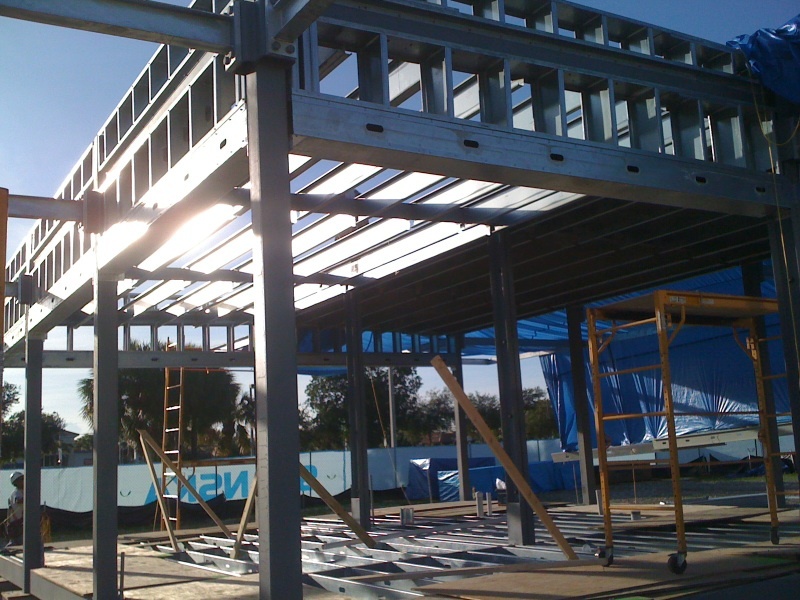 The exterior Deck will be built entirely by the students. 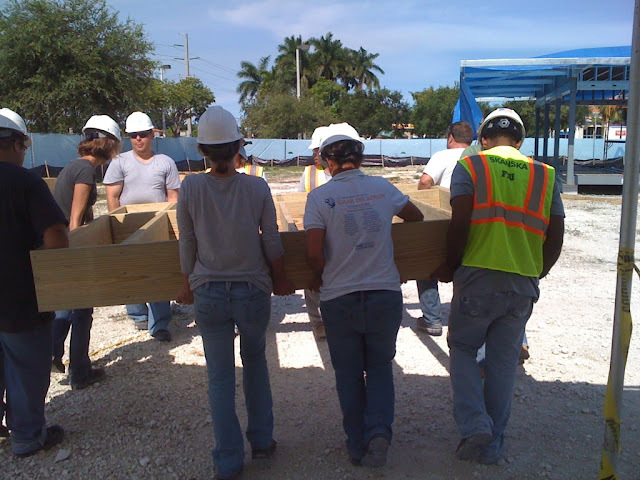 Alvaro, Alfonso and Cristina as they received the wood on site. Since the wood arrived, the students have been working on site as they begin to build each module of the deck, we will have approximately 40 modules that will come together in Washington DC to form what will be the amazing exterior space of the Perform[D]ance House. Double checking the shop drawings to continue working on the deck! We won't let the RAIN stop us! 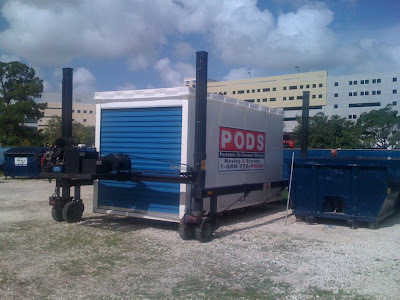 A few days ago, we had to shut down the job site at 10am because of the RAIN! Today the team came up with a new game plan to defeat the RAIN… The installation of a tarp over the structure of the Perform[D]ance House! It was a success and the team was able to finish installing the floor joists! Today, we experienced heavy rain causing the tarp to fill with water and eventually collapse. The team came up with the idea of attaching 2x4's for support and it was a success, again... we won't let the rain stop us! 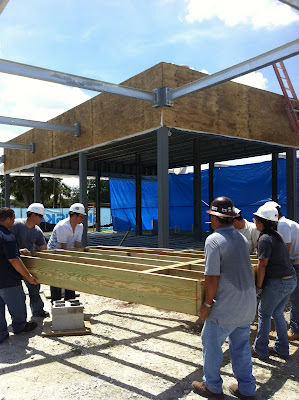 Today, the team tightened all bolts between the two steel frames that compose the house. These will come apart once the house is ready to be dismantled to travel to Washington DC at the beginning of September. 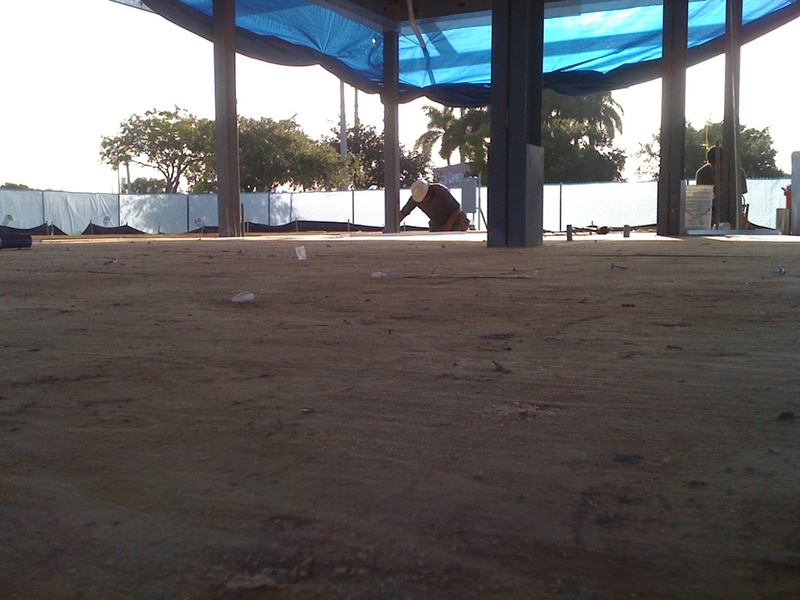 Also, the installation of the flooring system began, as we faced rainy South Florida weather!